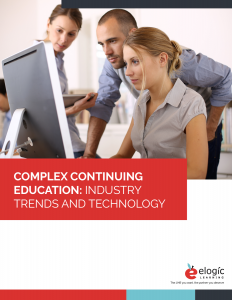 FREE DOWNLOAD: Complex Continuing Education Guide. Learn about how to further your workforce’s education with all the right tools and advice from experts. Sometimes, it can be good to get out of your comfort zone and learn new things from other industries. Sales is an area of training that is extremely widespread and researched. Many companies have sales training techniques perfected in an effective program to create sales stars. If you’re not in sales, maybe there are some things you can learn from the ways people train those in sales. As children, we learn more from watching what our parents do than what they actually tell us. That’s why parents use the cliché “Do as I say, not as I do!” Learning by watching others is powerful. One of the best ways to get a new employee up to snuff is to pair them with an experienced coach. A coach can show a learner the subtleties of their new responsibilities the way videos or reading reference guides can’t. Some companies fear coaching because the don’t wish to pass down bad habits or unapproved practices to new employees. In that case, it might be wise to look into train-the-trainer programs that make sure those in coaching positions are aware of and make good use of approved best practices. Role play is especially useful if you hope to train people on anything that has to do with interacting with others. Sometimes just reading about interaction techniques doesn’t help when it comes to actually applying it in the real world. People tend to get nervous and revert to tactics that are comfortable for them. Role-play gives learners an opportunity to practice interactions in a low-stakes, safe environment. It might be especially helpful for potentially difficult conversations. At eLogic, the sales teams gets together at least once a year to share what happened during significant losses. While not every deal is winnable, talking about the losses helps the team understand what actions and extra effort could have tipped the odds in their favor. In sales, an opportunity is a prospect that the salesperson believes might be a good candidate for purchasing the product. In a group opportunity review, the team gets together to look at the potential customers and help each other think of ways to turn that opportunity or potential client into an actual client. Outside of sales, this can take place in the form of teams getting together to talk about what they’re working on and sharing the things they’re struggling with. The power of the team to offer ideas, brainstorm, and lift each other up is a way for everyone to learn and build better relationships among team members. 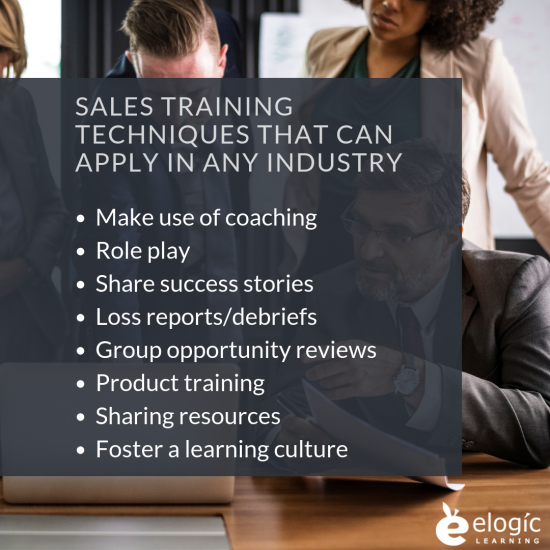 The eLogic sales team is selling business software that meets very specific needs, so one of the most important ways we support the team is to train them on the business impacts of particular software functionality. This enables the sales team to demonstrate to prospects what our software can do for them. Potential clients really appreciate the knowledge and the ability to ask questions and have them answered. That product knowledge is not only useful in sales. For example, workers in distribution roles need to understand the product so they can find the right balance between safe and cost-effective transport. Employees in IT and support need to understand products so they can better fix them. Those working in retail need to understand how to properly care for the products on their shelves – and they often have a role in selling product as well. Product training techniques have a wide variety of uses worth exploring. Another great option for continuous learning is providing platforms for workers to share resources. Whether it’s a Wiki or database or Salesforce, or even a bulletin board in the hallway, having an area for learners to share things with each other will spread knowledge and motivate learning. This training technique should be supervised to make sure that shared knowledge doesn’t conflict with company best practices. Several of these suggestions involve commitment over time to create continuous learning. This keeps employees on their toes and always ready to improve their day-to-day skills in small ways on a frequent basis. In order to do this successfully, you must encourage employees to be excited about learning through fostering a culture of learning. This can be done with consistent communication about learning and asking company leaders to model the importance of learning by engaging in it themselves, talking about learning, and offering incentives. These sales training techniques work for many sales teams (including our own!) and hopefully will give you some ideas for out-of-the-box ways to create learning on your own team, whatever industry you work in, and encourage team members to share and foster continuous learning. Interested in your team continuing their learning? Understand more about complex continuing education (CCE), including continuing ed management tools and what the experts have to say on upcoming trends.